Looking to transform your retail premises' forecourt, or redesign your school's gardens? Want to add a new feature to a public park, or renovate the gardens at your rental property? Whatever size and shape your garden may be, Ricky Tyler Landscapes will soon have it looking fantastic. With landscaping solutions designed to suit every season and a focus on eco-friendly, sustainable landscape solutions, we deliver fantastic work for businesses and public agencies across the UK. As skilled and qualified landscapers, we've been in business since 2002 and have built up a strong reputation since then. If you'd like to know more about our work, or if you'd like a free quotation with no obligation, call Ricky Tyler Landscapes today. Based in Potters Bar, we can undertake projects across the country and have been involved in some fantastic landscaping projects for clients in a wide range of industries. From grounds maintenance and planting, to fencing, turfing and paving, our landscapers can create any effect you choose and install a design that suits your tastes, your available space - and your budget! We take great care to provide a service that leaves you with a perfect garden for any commercial space. If you can imagine it, we can create it. Get a dream garden for any commercial premises, at a budget-friendly price and in line with your schedule. Leave the task to the experts and let our talented garden design specialists take up the challenge. We're also here to keep your garden or grounds looking good all year round - arrange your regular maintenance contract with Ricky Tyler Landscapes today. 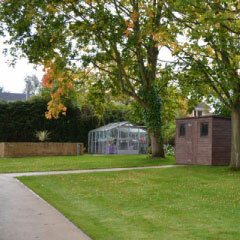 Ricky Tyler Landscapes can provide gardening and grounds maintenance services including Commercial Landscaping covering London, Essex, Hertfordshire, Northampton, Buckinginghamshire & Bedfordshire .